Janine Driver was trained as a lie detection expert for the ATF, FBI, and the CIA and is a New York Times bestselling author (You Say More Than You Think). Now she makes a powerful and incontrovertible declaration: You Can’t Lie to Me. Driver—who is known in professional circles as “the Lyin’ Tamer” and has demonstrated her world-renowned expertise on such programs as The Today Show, The Dr. Oz Show, and Nancy Grace—now offers readers essential tools that will enable them to detect deceptions, recognize a liar, and ultimately improve their lives. For readers of Never Be Lied to Again by David Lieberman and anyone worried about the possibility of cheating partners, devious co-workers, lying employees, or ubiquitous con men, You Can’t Lie to Me will help you uncover the truth in any situation while giving you the skills you need to keep yourself happy, your family safe, and your business protected. 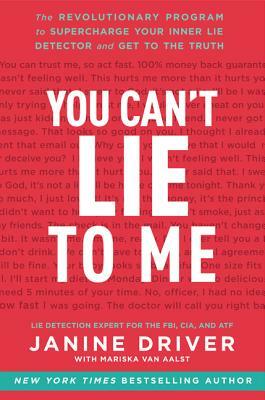 Janine Driver is a world-renowned human lie detector whose New York Times bestseller You Say More Than You Think has been translated into fourteen languages. She has appeared on HLN's Dr. Drew On Call, The Today Show, and The Dr. Oz Show among many other media outlets. She lives in Alexandria, Virginia.